VietNamNet Bridge – In the past few years, the income of Vietnam’s top chess player Le Quang Liem has increased remarkably, thanks to funding from sponsors and bonus from international chess competitions. In 2010, with the Aeroflot championship, Quang Liem received 21,000 euros. At the Moscow Open Chess, he got 8,000 euros for the bronze medal. In addition, the runner-up position at the Dortmund Sparkassen Chess Meeting in Germany brought about 7,000 euros, the championship of the chess tournament to commemorate President Fide - Florencio Campomanes in the Philippines $9,500) and the national championship $4,000 for him. Early in 2011, Liem ranked 4th at the Tata Steel chess tournament in the Netherlands, receiving $4,000 of bonus. He also earned extra income from playing for several chess clubs in the world. For example, in 2011, Liem played for Bremen club of Germany in March, the Evry Grand Roque Club of France in April and the Qingdao Yucai Club of China in June. The pay for each win game is from $300 to $700. With continued success, Le Quang Liem has become one of the most famous athletes of Vietnam at present. From the beginning of 2012, Liem will receive $150,000 funding from the Vietnam Chess Association. The funding for Liem is allocated annually. In the first year, he will receive $30,000, $35,000 for the next year, $40,000 and $45,000 for the subsequent years. After each year, the two sides will sit down to sign addendums and the funding will increase if Quang Liem achieves excellent results. 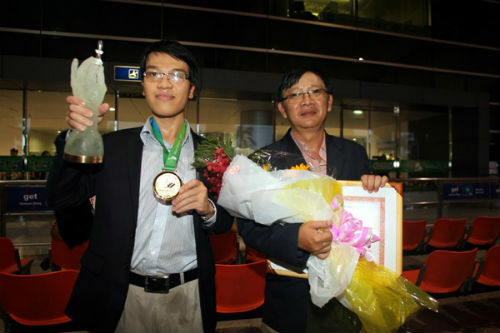 In 2013, after tournaments at home and abroad, Quang Liem received VND1.3 billion (nearly $70,000) from the 4th position of the world rapid chess competition and the championship of the world blitz chess in Russia. If Quang Liem plays well at the Asian Indoor Sports and Martial Arts Games, the World Cup and the 27th Southeast Asian Games this year, his bonuses will increase many times. With his accomplishments, Quang Liem earns at least VND2-3 billion ($100,000-$150,000) annually besides special funding from the Vietnam and Ho Chi Minh City Chess Associations. Liem is typical example for athletes who can live well in their job if they are really talent and have good luck. Actually, Quang Liem’s family invested a lot of money to develop his talent. Liem’s parents hired foreign coaches for their son or covered participation fees for international chess tournaments. Moreover, Quang Liem had to work very hard to be successful today.